When you have metal items for a long time or they get used a lot, they start to loose their shine and tarnish. This often makes the item look old, tired and less valuable. This is where Anti Tarnish Paper Strips come in. Anti Tarnish Paper Strips are paper strips that you leave near metal items to help prevent them from tarnishing. For example, if you keep your jewellery in a jewellery box then you could put one in there, or if you sell your jewellery you could include one in the packaging. 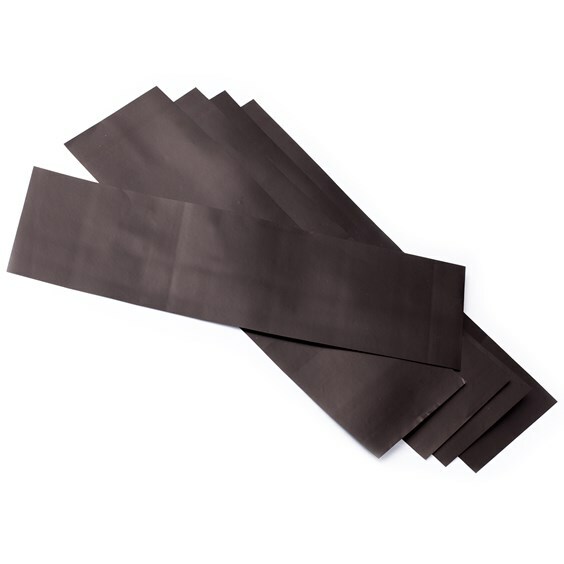 These anti tarnish paper strips have been impregnated with 3M`s Tarni-Shield technology which protects metals from tarnishing by absorbing sulphides and other pollutants in the air which cause tarnishing to occur. They will protect silver, gold, copper, bronze, nickel, tin and plated metals; for everything from jewellery to musical instruments. To use, simply place a strip (or trim a piece off) in an enclosed space alongside your metal items. The more air-tight the area is the longer the strips will last. As a rough guide, one 17.5x5cm (7x2”) strip will protect one cubic foot of space for approximately 6 months. You can always trim down the strips to store with smaller pieces of jewellery in a smaller space or grip seal bag. For example, you could trim one sheet into seventeen 1cm strips; so they go a long way! The anti tarnish paper doesn`t need to be touching the metal but just need to be nearby. They are non-toxic, emit no fumes and leave no residue. Please note that these won`t remove existing tarnish, so your jewellery should be clean when being stored away. You should replace the strips approximately every 6 months but their effectiveness can vary depending on the environment they`re stored in (for example, due to the amount of pollution or humidity in the air and how air tight the packaging is). If your metal starts to tarnish then you should clean it and replace the strips. If stored correctly, any unused strips should last up to 2 years; just make sure they`re stored in an air tight bag. Time scales will vary according to your surroundings so you may even find they last much longer than the times we've given. To view out Anti Tarnish Paper Strips click here. For any further advice regarding the contents on this page or for any other general jewellery making enquires, please feel free to get in touch, we would love to hear from you.